(Nanowerk News) Bioengineers at the University of California, San Diego have developed a method of modeling, simultaneously, an organism’s metabolism and its underlying gene expression. In the emerging field of systems biology, scientists model cellular behavior in order to understand how processes such as metabolism and gene expression relate to one another and bring about certain characteristics in the larger organism. In addition to serving as a platform for investigating fundamental biological questions, this technology enables far more detailed calculations of the total cost of synthesizing many different chemicals, including biofuels. Their method accounts, in molecular detail, for the material and energy required to keep a cell growing, the research team reported in the journal Nature Communications ("In silico method for modelling metabolism and gene product expression at genome scale"; open access). 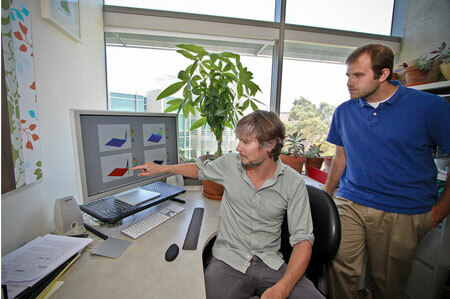 Project Scientist Daniel Hyduke and Ph.D. candidate Joshua Lerman, in the Palsson Systems Biology Research Group, Department of Bioengineering, discuss how their model enables detailed calculations of the total cost of synthesizing many different chemicals, including biofuels. “This is a major advance in genome-scale analysis that accounts for the fundamental biological process of gene expression and notably expands the number of cellular phenotypes that we can compute,” said Bernhard Palsson, Galetti Professor of Bioengineering, at the UC San Diego Jacobs School of Engineering. “With this new method, it is now possible to perform computer simulations of systems-level molecular biology to formulate questions about fundamental life processes, the cellular impacts of genetic manipulation or to quantitatively analyze gene expression data,” said Joshua Lerman, a Ph.D. candidate in Palsson’s Systems Biology Research Group. The team’s method can be compared to understanding both the chemical reactions and the machinery that are required to refine crude oil into petrol in a large, industrial factory. Modeling metabolism tells you what biochemical reactions need to take place. Modeling the organism’s gene expression tells you what kind of machinery you need. The team’s method specifically accounts for the expression of enzymes, which are the molecular machines responsible for the biochemical processes of life. With this knowledge, it is possible to explore how an organism distributes its resources to promote growth and how genetic manipulation of these organisms alters this distribution. “What you could hypothetically do with our model is simulate the total cost of producing a value-added product, such as a biofuel. That includes all the operating and maintenance costs,” said Daniel Hyduke, a project scientist in Palsson’s lab. Hyduke said the method has the potential to help streamline industrial metabolic engineering efforts by providing a near complete accounting of the minimal material and energy costs associated with novel strain designs for biofuel, commodity chemicals, and recombinant protein production. Hyduke and Lerman prototyped the method on the minimal, yet metabolically versatile, hyperthermophile Thermotoga maritima. Because T. maritima is not currently ready for use in industrial applications, Hyduke and Lerman are working as part of a larger team to produce similar models for industrially relevant microorganisms, such as E. coli. “We’ve built a virtual reality simulator of metabolism and gene expression for Thermotoga maritima, and shown that it much better approximates phenotypes of cells than modeling metabolism in isolation,” said Lerman.